PERI business solutions in the utility space include but not limited to Supervisory Control and Data Acquisition (SCADA) systems. PERI SCADA experience includes supporting clients with complete solutions, relocation, system maintenance, upgrades and migrations that are both vendor independent and vendor specific SCADA solutions. PERI helps clients assist in planning, procurement, implementation, integration, security and regulatory compliance of SCADA systems. 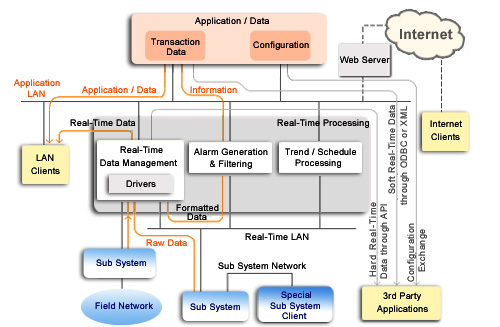 Below is a diagrammatic representation of a typical centralized SCADA system which monitors and control sites via PERI application data interface. Most control actions are performed automatically with alarm generation and real time data monitoring PERI systems interfacing with application data. Usually, PERI restricts Host control functions to basic overriding or supervisory level intervention. PERI enables the LAN and WAN clients to interact and set application set points affecting temporarily (overriding) of some sub systems. PERI monitors real time data and alerts alarms as appropriate. PERI system monitors to check whether certain alarm conditions are met. Once an alarm event has been detected by PERI monitoring systems, one or more appropriate actions are taken and applications are notified.